I enjoy Chinese food. I enjoy it a lot. I could eat it for breakfast, lunch and supper with eggroll and crab rangoon snacks in between. And, of course, one of my favorite parts of the meal is the fortune cookie. A cookie of absolutely no nutritious value houses a key to how your life is going to be unfolding in the future. Like the pearl found in the oyster shell. One glance at the little slip of paper will give you hope for the future in winning the mega-money lottery ticket to owning your own yacht to traveling the world over to having happiness and success for another fifty years. I’ve shared before how I visited a fortune-teller while I was in college and her reading was that I would be married, have children, a career with a large salary and a lot of traveling…..and that I would unfortunately die when I was only 50 years old. So far, I not married, have no children, had a career but not the big bucks, and….at last count, I am well past 50 years old. Madame Rosa in Olde Towne Augusta didn’t seem to know a whole lot about my future. 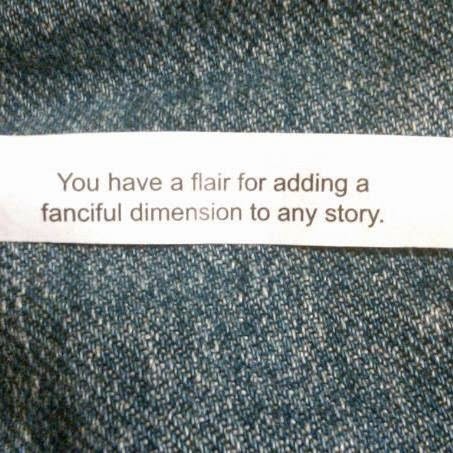 “You have a flair for adding a fanciful dimension to any story.” - If you follow my Facebook page, you probably know this one is pretty dead on. “You are gifted in many ways.” - I tend to think this is fairly accurate and give credit to God for those things I can do well. “Work on improving your exercise routine.” - The word, exercise, is not even in my vocabulary. “Now is the best time for you to be spontaneous.” - Again, spontaneous is not a word generally associated with me. “You and your wife will be happy in your life together.” - see the Madame Rosa story above. My point in all this is to say that no cookie or person can possibly know what is coming up in my life, or in anyone else’s life. Not possible. God is the only one who knows our paths and our futures. Psalm 139 tells us that God “knows when we sit down and when we rise up; when we go and when we come. He knows our paths and our thoughts.” Of course, we have the free will to do as we wish, but God will still be involved, because He knows what we are up to and what the results will be. He allows us to go our merry way, making choices good or bad, and loves us even when we make those bad choices. He is our Creator and our Guide. This is what gives me hope. A little piece of paper in my cookie may give me a thought and a laugh with friends, but I know in my heart that it is just a piece of paper mass produced in some unknown factory. God’s Word to me is substantial. It will last forever. And you can put that in your cookie anytime! Are you all comfy cozy?